One of the delightful differences between cruising now and cruising in the '80s is all the advances in communications that are now possible. Usually, the best way to contact us is by email, of which we have 2 types: Radio‑based and land‑based. We're usually near land, not out in the middle of an ocean, so we can usually connect to the internet via a 3G modem, which allows us to check all of our email accounts every day. If you know we're near land, or you want to send an attachment, please use the email address shown at right. We check our land eddresses as often as practicable (usually every day) but if we're at sea or somewhere remote there can be a delay of a few weeks (or even months if we're somewhere like Chagos or Mozambique). If we're at sea or in a remote area then the only way is to send it to our Radio Emaill account at left. We check that almost every night so we can get back to you quickly. 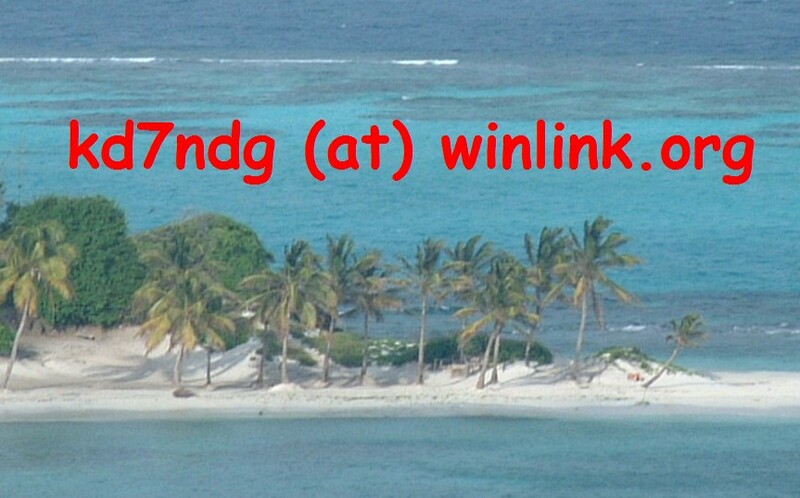 However, there are several caveats with our Winlink radio email. It comes to us over the SSB radio - extremely slowly (usually 1-2 minutes/page). Therefore we ask you to send email in plain-text only. Important Note: Due to increasing spam and recent changes to our email server, you must now include the 6 characters //WL2K somewhere in the Subject: line. Otherwise, your email will be bounced and we will not be notified. You will have to resend the email. Once we email you, your eddress will be in our white-list (for 6 months) and you will no longer need the //WL2K. 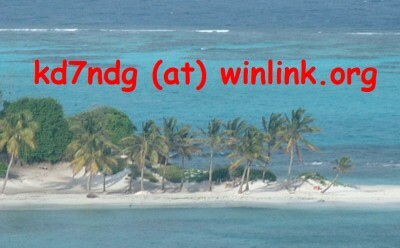 Please remember to check the plain-text button when composing your emails to this Winlink account. Otherwise you will be sending "HTML mail" which has a bunch of formatting tags embedded in it. The Winlink servers will strip out all of the HTML tags to reduce email size, and the resulting text will arrive badly mangled. Also, please ask us before sending any attachments and do NOT include our message when replying. Yes, several limitations, but this is still the only way to contact us if we're in remote areas and we welcome your emails. Unfortunately, spammers love to send scanners out to sniff websites for email addresses, and we hate spam. So we've written our email addresses into graphics that humans can read, but automatic scanners can't. It's sad that we have to go to such lengths, but such is the Internet these days. For Facebook users, Ocelot has a Facebook page where we try to post photo albums of the places we visit. If you "Like" the page, you'll get notifications of updates. It's also a good place to leave us short messages. For voice communication we use Skype (as sv-ocelot). We even have a Skype phone number: +1‑206‑923‑9714. It's a Seattle area‑code, but it rings through to us wherever we are if we're online. If we're offline, it takes a message and notifies us when we're next online. For callers from outside North America, we do usually have a mobile (cell) phone, but we don't usually have roaming coverage, so we buy a new SIM chip whenever we get to a new country. This means that our phone number keeps changing. If you email us and ask, we'll send you our current number. This information is also usually included in our newsletters (sign up here).